Have you considered the advantages that are available when you upgrade the window coverings in your Broomall, PA home? If you are thinking about these upgrades for your home, you should take a few moments to learn more about the ways you would benefit from high-quality window coverings. Here at Blinds and Drapery Showroom, we are focused on the satisfaction of each customer. Our goal is to help you see why we are one of the leading contractors in Broomall, PA, and the surrounding areas. When you work with our team, you will receive excellent customer service and high-quality products. Take some time to learn more about the company, and you will quickly see that we have a long list of customers. Does it make you uncomfortable to feel like the neighbors can see in your windows? Some homeowners keep their window coverings closed all the time because they want to maintain their privacy. The problem is that certain types of coverings block the sunlight and make your home seem dark even when there is sunlight outside. Consider blinds or shutters that are designed to maximize sunlight while maintaining privacy at the same time. For example, certain designs allow you to keep the bottom section closed and the top area open to let the sunlight into the room. The value of your property matters because it will impact the equity that is available when you decide to sell in the future. If you want to boost your home value, you may need to look at renovation projects that will improve curb appeal. Shutters or high-quality blinds can go a long way to making your home look great. By investing the money in these products, you will be able to ask a higher price tag when you decide to sell in the future. Even if you aren’t planning to sell your home right away, you can enjoy the benefits of upgraded window coverings until you decide to move. Most homeowners dislike high utility bills. It can be frustrating to have to pay expensive utility costs when you are trying to pay the mortgage and maintain the cost of managing a household. Instead of being frustrated by the high utility bills, try to look for ways to improve the energy efficiency of your home. High-quality windows go a long way to reducing energy usage. You can insulate those windows even more by adding high-quality window coverings. When you are updating the décor in your home, don’t overlook the importance of window coverings. New furniture and room décor will look nice, but the overall appearance won’t be complete until the window coverings match the new design. Consider the style that is used in the room so that you can choose window coverings to match. 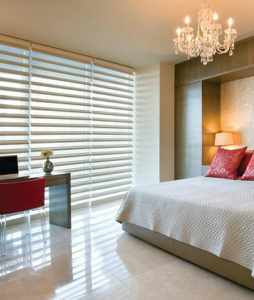 Some homeowners select high-quality blinds or shutters that have a timeless elegance to match any design inside. Other times, it might be fun to choose statement window coverings that will accent the décor in the room. For example, you can pick window shade fabric that will accent the room and add a pop of color. In addition to saving money on the monthly utility bills, as mentioned above, you can also cut costs on the installation of the new window coverings. Home renovations don’t have to be expensive when you are working with a contractor committed to helping you manage the expenses. Here at Blinds and Drapery showroom, we have negotiated discounts with our suppliers. As a result, we can pass those savings onto you, helping you to reduce the cost of your home renovations. Our customers love the high-quality products that we offer and the discount prices that are available. Are you ready to learn more about shutters, blinds, or shades for your home in Broomall, PA? At Blinds and Drapery Showroomwe are here to help with the home upgrades your family needs. Our team is happy to answer your questions and will help you to identify the coverings best suited to your windows and preferences. We invite you to contact us to schedule a consultation so that you can see if new window coverings are right for you.